Many fly anglers eagerly await the start of the spring steelhead run. 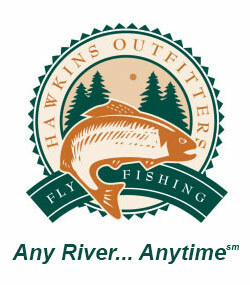 In this blog post I will point out what I believe are the top five spring steelhead flies. I will show you how to tie them and explain when to use them. 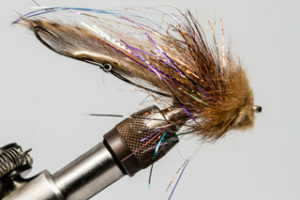 Any list of the top five steelhead flies for spring or for anytime has to include the clown egg. Steelhead love them! 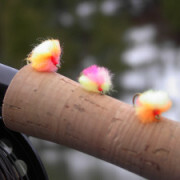 In addition to the clown egg the list also includes our rabbit wiggle nymph pattern, a black stone, Ed’s Salmon Alevin fly and a good sculpin / goby pattern like the Purple Traitor Sculpin. A Clown Egg is the easiest to tie and the most versatile egg pattern that I know of. The rag style tie produces the most translucent egg imitation. Just as important as carrying the right top five spring steelhead patterns is understanding the spring run and when to fish these flies. The spring run of steelhead can be broken down into three distinct segments. Pre-runoff, during the run off and post spawn. Substantial variations in fish behavior, water flows and water temperatures requires the fly angler to change the patterns to meet these challenges. Pre run off the water is usually low, clear and cold. The number one fly during these times is the clown egg. Clown egg colors need to differ in different conditions. There is no color that is superior all season long. In the cold water during winter and early spring combinations of pinks and oranges usually out perform other mixes. Just as important as color is size. Consequently during low, cold water I like my eggs to be no larger than a dime. As the snow pack melts and the rivers increase their water volume they generally become much more turbid. This requires changes in patterns, color and size. Most importantly we need to revisit the clown egg. Brighter colors and much larger sizes are now in order. Chartreuse, oranges, bright yellows all have a place in these eggs, which are now the size of a quarter or more. They have to see them to eat them! When we have these water conditions we go deeper into my list of the top five steelhead patterns for spring. This is when the Black Stone and the Rabbit Wiggle Nymph come into their own. 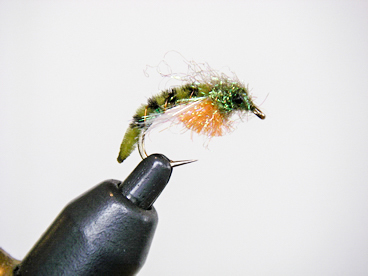 The Rabbit Wiggle Nymph is an effective pattern to fish either dead drift or swung on a tight line. It is easy to tie in a variety of colors like tan, ginger, olive, white and black. Ginger has been the most productive for me through the years. Step by step tying instructions are here. Black stones are the most available hatching insect in springtime. They are prolific on most of the waters we steelhead fish. Because they are hatching you know that they are moving around on the bottom and are very available to hungry fish. Tie these bigger than the ones you see hatching because they need to be seen to be eaten! After the run off, as the spawn hits full swing and the drop backs are on the move, time to change again! The clown egg is still strong but size reduces back to the dime and colors change. More muted colors similar to the natural eggs will get response. Jon Ray’s Lemon Parade Clown Egg is a player this time in the year. With steelhead grinding the rocks to spawn they dislodge a lot of caddis larva. Ed’s Alevin pattern can be taken as a caddis larva. or a salmon and should be fished at this stage of the run. ideal swing pattern when hunting drop back steelhead. 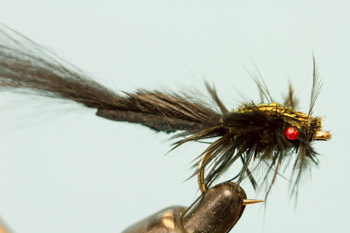 With the amount of Gobies, Sculpins, and Chubs in the river during the spring, this fly matches the hatch. Trying tying one with an all black head to match the spawning colors of the male goby’s. 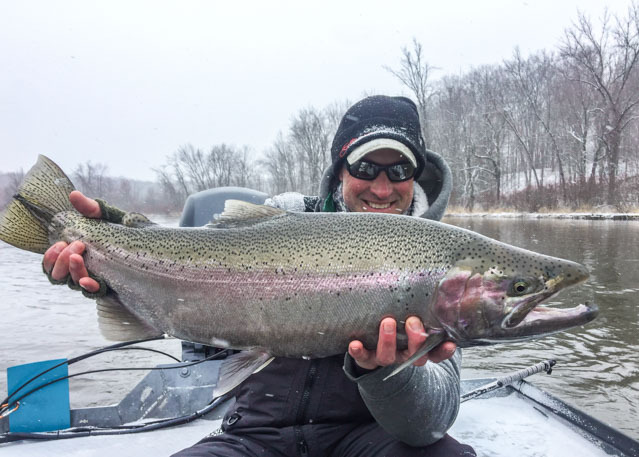 Knowledgeable anglers carrying these top five steelhead patterns in a variety of colors and sizes so they can adjust to changing water conditions. Fished in the correct manner in the right places these flies will produce results. Another pattern that should be added to your Spring Steelhead fly box is the Fry and Egg pattern espically effective on the Pere Marquette, when the salmon fry have hatched. Equally effective for steelhead and brown trout.